The final decision on the Anthem insurance rate request is in. 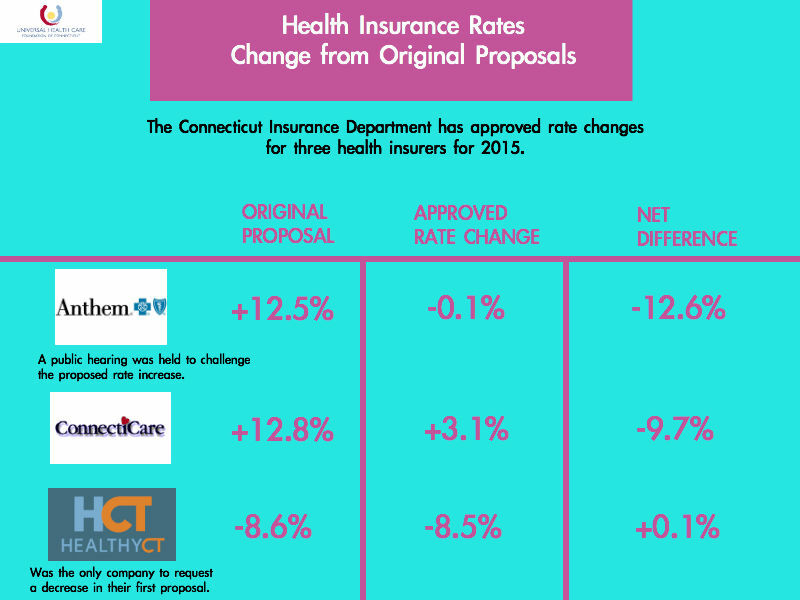 An even more significant rate decrease, an average drop of 8.5%, was approved by the Insurance Department for Connecticut’s only non-profit insurer, HealthyCT. This decrease should mean that HealthyCT’s rates may end up being more competitive than they were in 2014. Meanwhile, ConnectiCare will be increasing rates by an average of 3.1% in 2015. Overall, differences in rates between the plans are likely to be minimal, perhaps leading customers to make selections based on other factors such as provider networks and customer service. Depending on the Anthem plan, actual rate changes will vary from a 15.5% decrease to a 4.2% increase. Scroll to the bottom of this CT Mirror article to see rate changes by plan.